To prepare Mini Biscuits: Preheat conventional oven to 350 degrees. Place frozen biscuits on a lightly floured cutting board. Allow to thaw for about 10 minutes. When slightly soft, cut biscuits into quarters. Then cut each ¼ in half, yielding 8 squares of dough per biscuit. Bake for about 12 minutes, or until biscuits are light golden brown. Set aside. Prepare sausage according to product instructions. Let cooked sausage rest for 5 minutes before slicing. Slice warm sausage into coins about ½ inch thick. Skewer Assembly: Split mini-biscuits. Spread one side with butter, other side with your topping of choice. I used one of my favorite chutneys, Stonewall Kitchen's Apple Cranberry Chutney. 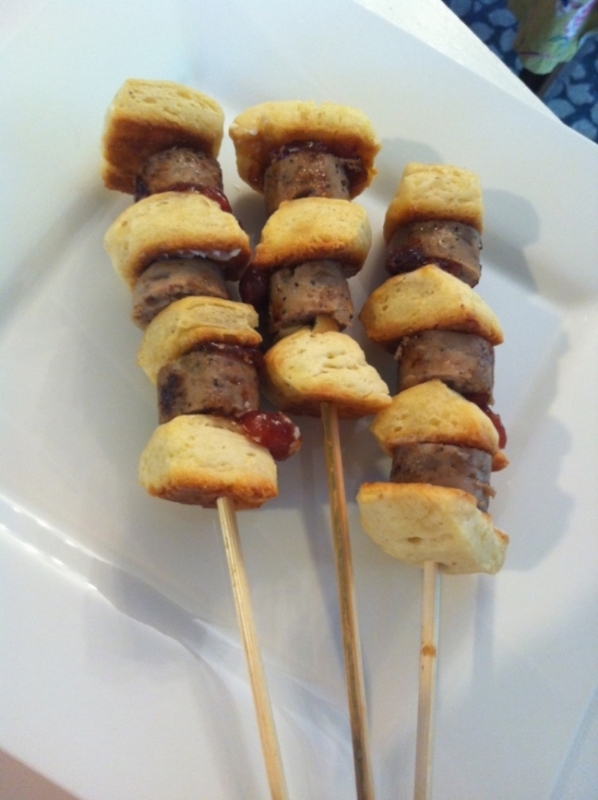 Slide mini biscuits over skewer, then sausage. Alternate skewering a sausage piece, then a biscuit. Use 4 sausage pieces and 4 mini biscuit halves for each skewer. Serve skewers as warm as possible on a platter. Here are some good sausage and condiment combinations you could try, depending on the fans in attendance. These won't stay on the plate long, especially if my friend Anna is around! She looks like she's posing but this bite... happened.